I recently finished reading Clark Smith’s Postmodern Winemaking: Rethinking the Modern Science of an Ancient Craft where he advocates for a balance between winemakers using all the tools at their disposal (like reverse osmosis, cross-flow filtration, etc) but not lose sight of “soulful winemaking” and letting the wine tell the story of where it came from. It’s almost a contradictory position that is the vino-equivalent of the Kobayashi Maru. Throughout the entire book, Smith advocates for, above all, more transparency in winemaking. A winemaker shouldn’t use any tool or additive that he or she would not feel comfortable openly talking about. In that regard, he and Master of Wine Isabelle Legeron would be kindred spirits. In her interview with Alistair Morrell, Legeron draws the connection between consumers’ concerns over sourcing and knowing what’s exactly in their food and how that is changing the wine they are drinking. However, as I discovered in researching for my article about Vegan wines, the wine industry has a bit of a halo effect that has long been given a free pass in most consumers’ minds because—it’s just grapes, right? Well….not exactly. Like Smith, I don’t think winemakers should be demonized for using technology but I also find sympathy with Legeron’s view that consumers should know what kind of chemicals are being used in the vineyards, what additives like Mega-Purple or oak chips do and what in the world was done to make a wine like Apothic Brew exist. The article also touches on some of the issues that “natural producers” dealt with in the troublesome vintage 2017 which brings me to my next article of interest. As the 2018 en primeur tastings wrap up, we’re getting ready for the start of the 2017 Bordeaux Futures campaign. I’m buckling down into my research as I plot my own personal strategy and purchases. I bought very heavily in the 2015 and 2016 campaigns so I naturally expect to buy much less in 2017. But I’ll still buy something. My initial instinct is that 2017 could serve as a fair “cellar defender” vintage meant to be open for more short term consumption. I use the term “cellar defender” because my cellar will now have a nice stash of 2015/2016 that I will need to fight off the temptation to open too soon–a fate that has unfortunately befallen many of my 2009/2010 gems. If I want to get the full value of my pleasure investment in these potentially great 2015/2016 wine, I will need to have a few good “sacrificial lambs” to help keep my grubby paws off the good stuff. The key will be in sorting through the hype and fluff to find the real value. I don’t want to pay filet mignon prices for my mutton. The Chanel Group’s holding of Ch. Canon, Ch. Rauzan-Ségla and now Ch. Berliquet intrigue me because the first two have undoubtedly been on the upswing and reaping the benefit of investments in the vineyards and winery. Rauzan-Ségla has particularly impressed me with delivering quality results in the troublesome 2012 and 2013 vintages. While I would not want to go into the $100+ range, if the 2017 is priced in the $75-80 range like those 2012/2013s then I might be intrigued. Making Varietal Wines in Bordeaux by Vicki Denig (@vicki_denig‏) for Seven Fifty Daily (@SevenFiftyDaily). Brought to my dash via John Corcoran (@jncorcoran1). Going along with my Bordeaux mood, I got very excited reading about this new project with Michael H. Kennedy II of Component Wine Company in Napa (a protege of Aldo Sohm) and Château Lynch-Bages to come up with a special series of varietal wines from some of the Cazes family’s holdings in the Left Bank. While blending is always going to be intimately connected with Bordeaux, the chance to try the individual components in isolation (from such a high quality producer) is worth geeking out over. Of course it will depend on if the price is crazy or not. While I expect to pay $100+ for Ch. Lynch-Bages, I’m not sure a varietal Cabernet Franc from them at that price is going to entice me. My optimistic hope is that these Component wines will be priced more in the $35-45 range. I signed up for Component Wine Company’s mailing list to keep an eye on this project and will post any updates. In addition to getting knee deep in readings about the 2017 Bordeaux vintage and Futures campaign, I’m also prepping for my upcoming trip to Paso Robles for Hospice du Rhone at the end of this month and a trip to Burgundy at the end of May. So expect to see a few more posts geeking out about Rhone varietals and a couple more installments in my “Keeping up with the Joneses in Burgundy” series. 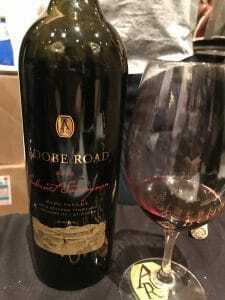 My top wine at the 2017 Wine Spectator Grand Tasting was this Adobe Road Cabernet Sauvignon from the Beckstoffer Vineyard Georges III in Rutherford. In the middle, I’ll also be attending the Wine Spectator Grand Tour Tasting in Las Vegas. You can check out the first part of my three part series from last year’s Grand Tour Tasting here. While my blog postings won’t be as frequent during my travels, I will still be posting regularly to Instagram and Twitter so feel free to follow me on those platforms as well. Tagged Adobe Road, Alistair Morrell, Apothic Brew, Beckstoffer Georges III, biodynamic, Bordeaux blends, Bordeaux futures, Bordeaux vintages, Cabernet Franc, Cabernet Sauvignon, Cazes Family, Cellar defender, Ch. Berliquet, Ch. Canon, Ch. Rauzan-Ségla, Chanel, Clark Smith, Component Wine Company, Hospice du Rhone, Isabelle Legeron, James Molesworth, John Corcoran, Keeping up with the Joneses in Burgundy, Lynch-Bages, Master of Wine, Mega Purple, Michael H. Kennedy II, Organic viticulture, Paso Robles, Postmodern Winemaking, Rutherford, Seven Fifty Daily, The Buyer, Vegan wines, Vicki Denig, Wine Spectator, Wine Spectator Grand Tour. This scandal has been making waves in the wine world for a couple days now but this report from Mustacich is the first I saw that named names–pointing to the négociant firm and bulk bottler Raphaël Michel. This is important because when consumers read headlines blaring that 66 million bottles or 15% of the Côtes du Rhônes produced from 2013-2016 were cheap swill passed off as higher AOCs, that naturally cast suspicion on every bottle of Rhone. It also doesn’t help when publications like The Daily Mail use pictures of esteemed estates like Ch. Beaucastel and Clos de Papes as the illustration for their article that talks about Raphaël Michel’s CEO, Guillaume Ryckwaert’s, arrest back in August 2017. With Wine Spectator getting the name of the real culprit out there, consumers should know that the Rhone wines made by established and small family producers are not part of this scandal. Unfortunately, it is not easy finding all the names of the bulk wine and négociant labels that Raphaël Michel produces (their eShop has only a few names) so the best advice for consumers is to do their homework. If you’re at a wine shop and see a Rhone wine from a producer you don’t recognize, Google them to see if they have an online presence that connects them to a real person or family behind the wine. Buying guides like Master of Wine Benjamin Lewin’s (@BenLewinMW) on the wines and producers of the Northern and southern Rhone are also valuable resources. Tablas Creek’s nursery in Paso Robles. The death of Tablas Creek founder Robert Haas is a great loss for the industry and my condolences go out to the Tablas Creek family. The entire Tablas Creek operation is top notch and I recently charted my path to becoming a wine club member there in my post Wine Clubs Done Right. Beyond just the establishment of Tablas Creek winery, Haas had far reaching influence in the Rhône Ranger movement by pioneering the introduction of several Rhone varieties to the US. Haas and Tablas Creek did the heavy lifting in getting cuttings from Chateau Beaucastel through quarantine and TTB label approval for numerous varieties like Counoise, Terret noir, Grenache blanc, Picpoul and more. Additionally the high quality “Tablas Creek clones” of Syrah, Grenache and Mourvedre have populated the vineyards of highly acclaimed producers throughout the US. For that we should all grab our favorite bottle of Rhone grapes (even better if it is Tablas Creek) and toast the amazing legacy of Robert Haas. THE FUTURE OF FERMENTATION: THE ROLE OF SYNTHETIC YEAST IN WINEMAKING by Becca Yeamans Irwin (@TheAcademicWino) for Spirited Magazine. Brought to my dash via Wine & Spirits Guild (@WineGuild). This was a very timely article for me as I just finished reading Clark Smith’s Postmodern Winemaking which deals with some of the philosophical issues and conflicts between improving wine technology, the Natural Wine movement and the winemakers caught in the middle who just want to make good wine. I’m not going to add any commentary at this point because Smith’s book has given me a bit to chew on. It’s clear that there is still a lot of discussion to be had about the “Future of Fermentation” with Yeamans Irwin’s article adding some worthwhile insight into that dialogue. Tagged Becca Yeamans Irwin, Benjamin Lewin, bulk wine, Ch. Beaucastel, Clark Smith, Clos de Papes, Côtes du Rhône, Counoise, fermentation, French wine, Grenache, Grenache blanc, Guillaume Ryckwaert, Master of Wine, Mourvèdre, Natural wine movement, négociant, Picpoul, Postmodern Winemaking, Raphaël Michel., Rhone Rangers, Rhone wine, Robert Haas, Rupert Millar, Spirited Magazine, Suzanne Mustacich, Syrah, Tablas Creek, Tablas Creek clones, Terret noir, The Academic Wino, The Daily Mail, The Drinks Business, Vino101, Wine fraud, Wine Spectator, Wine Technology, Winemaking, yeast.